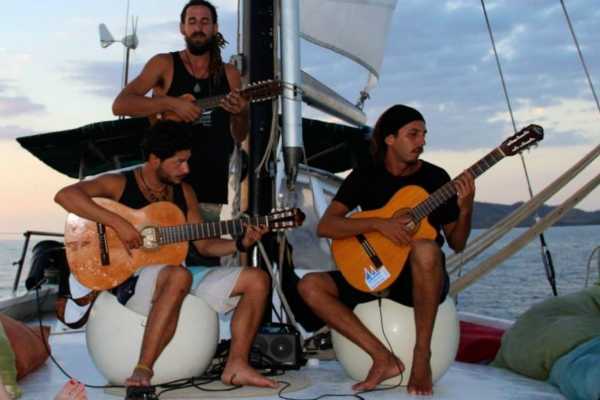 Includes: Open Bar 6 Course Gourmet Meal Drinks Snorkeling Swimming Duration: 5 Hours Antares is an 80 foot Sparkman and Stephens schooner anchored in Costa Rica's beautiful Tamarindo bay. Antares was built in 1947 and has won races around the world. This beautiful ship is family owned and operated. The Antares offers spacious deck space, with an assortment of large bean bags for extra comfort. Take in the rays or enjoy the breeze under our shaded cover. An on board chef will be below deck preparing 6 separate gourmet courses, that will be served to you throughout the evening. The chef can cater to any diet request such as vegetarian or gluten free. Tamarindo's Antares Schooner Sailing Ship sets sail daily from Tamarindo, beach weather permitting. ​ What to bring: Bathing Suit Sunscreen Towel Meet at the beach for this tour. Includes: Food Drinks Snorkeling Kayaks Snorkel gear and instructions Use of kayaks and fishing poles for trolling Appetizers including chicken fajitas, arroz con pollo (a typical Costa Rican dish of rice with chicken), salad, incredible chips & salsa, fresh fruit plate, vegetables & dip and banana cake. 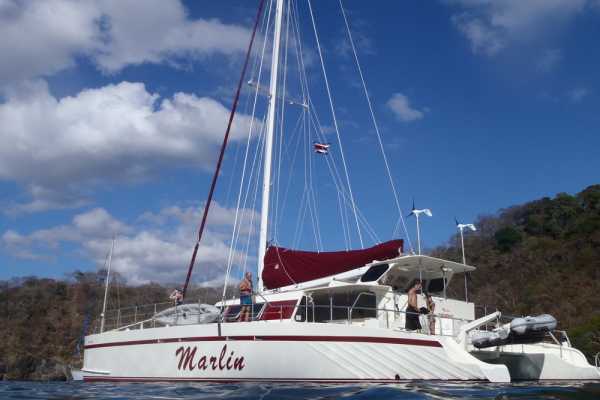 Open bar with juices, sodas, beer, white rum, guaro (a clear Costa Rican liquor), vodka and bottled water Duration: 5 Hours The Blue Dolphin is a custom built 40-foot sailing catamaran specifically designed to be the ultimate in day charters. Moored in the bay off Playa Tamarindo in Guanacaste, Costa Rica, the boat is packed with amenities including trampolines for sunning and lounging, a shaded main salon, fresh water shower, a clean restroom, well maintained snorkel gear, kayaks and a stairway to the sea. There is plenty of space to relax and an open boat layout. 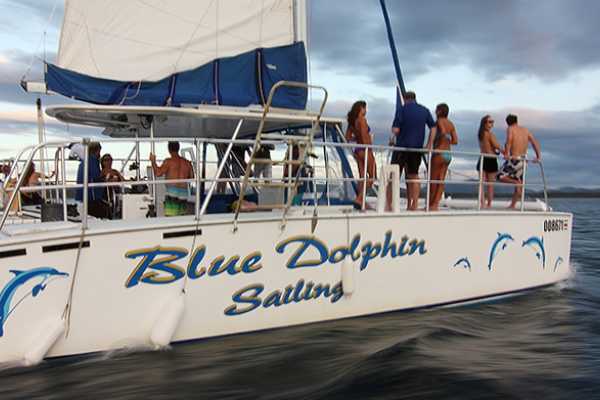 The signature Blue Dolphin experience departs daily from Tamarindo. The tour allows time for a little of everything. You will be able to enjoy the exhilarating performance of a catamaran, lounge in the sun, use our kayaks, and swim in the warm tropical water while spotting dolphins, rays and reef fish. Our friendly, professional crew will ensure your comfort and safety during this spectacular journey along the Guanacaste Costa Rica coast, a trip you’ll be sure to remember. Don’t worry if you’re not staying in Tamarindo you can still enjoy our tour as we'll be glad to assist you in arranging transportation from the Westin Conchal and JW Marriott, just let us know in advance. Our daily sailing trips allow you to spot local marine life from above the water as well as from below. We often encounter sea turtles, manta rays, dolphins and whales… and that is before we've started snorkeling. Meeting place for pick up for this tour is at Tamarindo beach.